With one day left on the South Island and yet another spectacular blue sky, Paul and I decided to hit the road and take a day trip to the nearby village of Akaroa, located about 54 miles/87 kilometers from Christchurch. Akaroa is the oldest town in Canterbury, founded by French settlers in 1840, and is a wonderfully quaint, beautiful village nestled in the heart of the Banks Peninsula. We had also heard that the area offered many opportunities for excellent “tramps” (or hikes as we call it) as well as ocean cruises to see New Zealand’s unique marine wildlife. We headed out early in the morning choosing to take the “scenic route” in our rental car. Apparently there are two ways to Aakora: One easy and relatively straightforward, and the other more spectacular, yet rugged. We took the latter. It wound up being a harrowing hour and a half drive from Christchurch but well worth the incredible views. There are two routes to Akaroa. 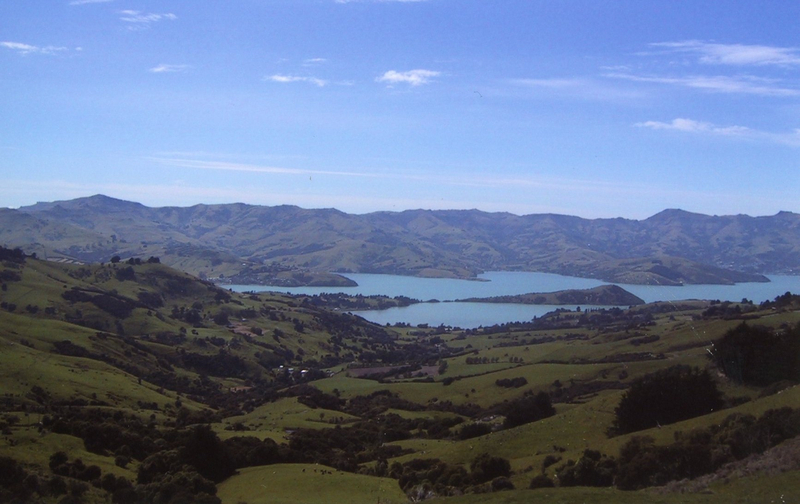 State Highway 75 takes you via Lake Ellesmere and Lake Forsyth before it climbs over the hills to Akaroa Harbour. The other route is very scenic, but longer and more difficult to drive. It takes you through the Lyttelton tunnel and around Lyttelton Harbour before making the rugged, cross country journey to Akaroa. 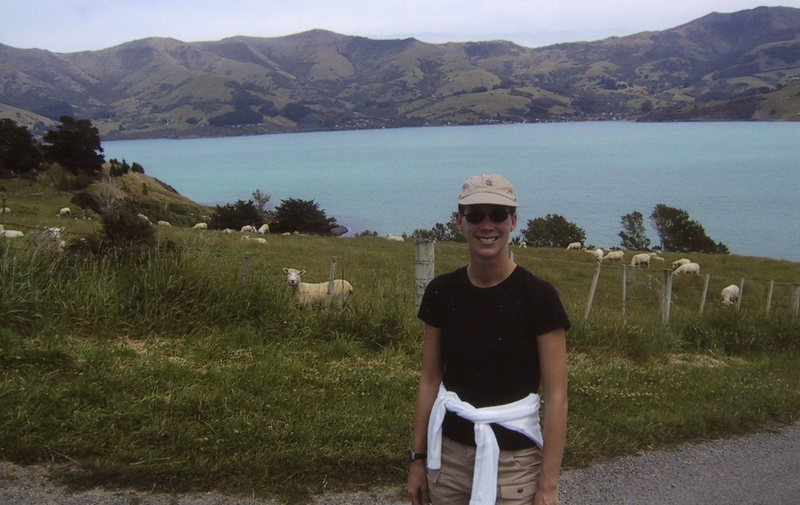 Photo taken during our “tramp” in the Banks Peninsula with the sheep looking on. We arrived in Akaroa safe and sound but my most hated friend, motion sickness, of course returned to bother me. Thankfully it always goes away once I get out of the car and get some fresh air. Plus there was no way I was going to let a little car sickness ruin my day for Akaroa was simply gorgeous! We spend the first hour wandering around the french streets admiring the charming, relaxing town and its frenchness. 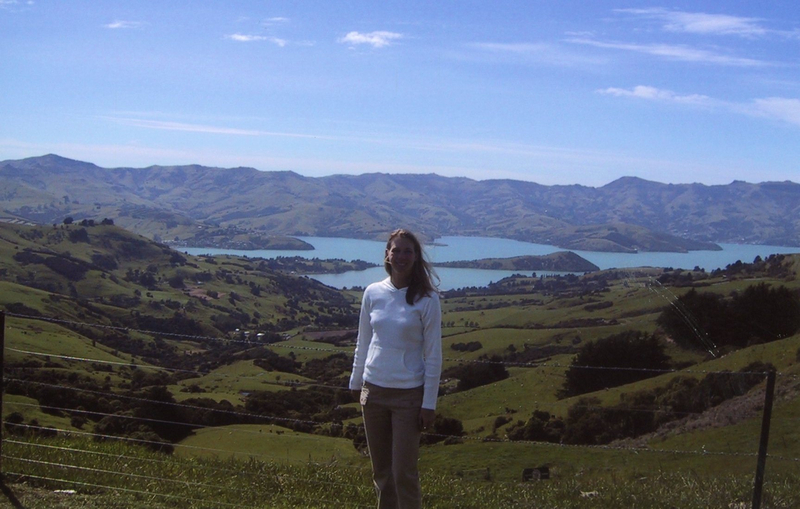 As a Francophile who lived in France twice, spend years learning the language and fell in absolute love with Paris, I certainly enjoyed Akaroa. The french words, signs and cafes made me smile and we had a delightful lunch at a french restaurant (bien sur!). After lunch we took a two-hour cruise into the harbor where we were thrilled to see some of New Zealand’s unique wildlife, some of which is native to this part of the world like Hector’s Dolphins. Many tourists come to Akaroa just to view Hector’s Dolphins, which is a small species of dolphin found exclusively in New Zealand. The peninsula is also known for Blue penguins (smallest of all penguins) and seal colonies. Since there are little predators or natural dangers to New Zealand’s wildlife, you often have an excellent chance of seeing them in their natural setting. In fact, New Zealand has often been called the “Seabird capital of the world” due to the number of species that live there or breed along its coasts. We enjoyed the cruise and saw the tiny Hector’s Dolphins, seals and penguins but I didn’t get any good pictures of them. (Remember, these were the days well before I wrote a blog and my lack of pictures of this trip is shocking to me now!). If I could do it all again, I would have taken ten times as many pictures in New Zealand and stayed for 20 days instead of 10. I guess I’ll have to put New Zealand back on my bucket list! After the cruise, we indulged in a scenic, two-hour hike above Akaroa following one of their many well-marked trails, that brought us up to an amazing panoramic view of the Banks Peninsula. The craters of past volcanoes have created the lovely setting of the harbor town of Akaroa on the Banks Peninsula. After a wonderful day in Akaroa, it was time to head back to Christchurch. As we drove along the snakelike turns along the rugged countryside, in the distance we saw it. It looked like an oasis in a desert or some kind of mirage. But as we got closer, we realized what we had thought at first was indeed true. We found a tiny little german restaurant and beer garden in the midst of the countryside. Of course we had to stop for an ice-cold beer to get us through the rest of the day. Here is Paul, chilling out with an ice cold Brew. This picture sums it all up…New Zealand rocks! 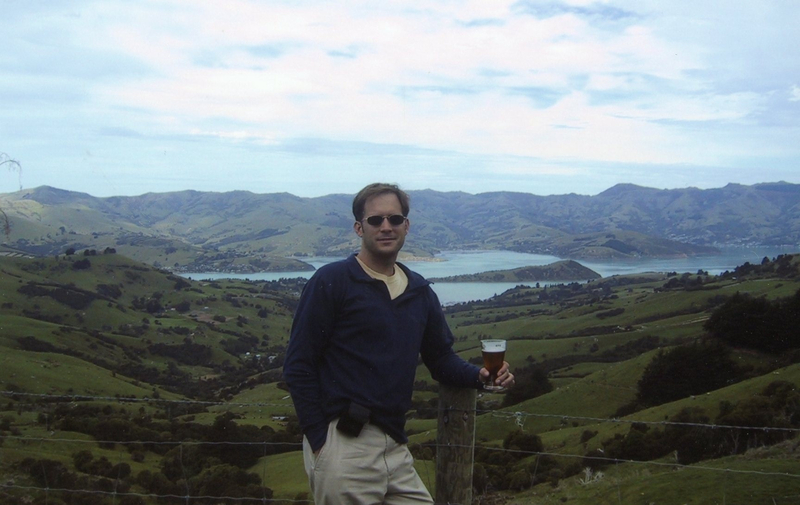 Stay tuned….we are headed to the North Island in my next few posts, which will finish up my series on New Zealand. I hope reading these posts make you want to go there! I sure want to go back! It is one of my most favorite places in the world.